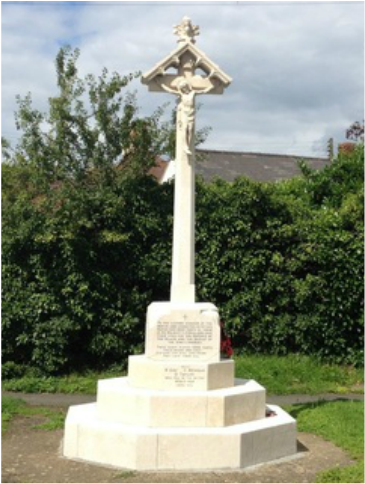 ​This is a cross by the roadside, at the junction of Willow Bank Road with St. Margaret's Road. The memorial is actually some distance from St. Margaret's church, presumably so that it could be located by a main road. Unit Text: 12th (West Somerset Yeomanry) Bn. Additional information: Son of Mrs. S. Bishop, of Alderton, Tewkesbury. Grave/Memorial Reference: VIII. E. 13. Grave/Memorial Reference: Pier and Face 5 A and 5 B. Additional information: Son of William and Annie Elizabeth Diston, of 78, Mount Pleasant, Teddington, Tewkesbury, Worcs. Grave/Memorial Reference: Panel 60 to 64. Many possible entries at CWGC. Additional information: Son of Philip and Rebecca C. Fletcher, of Hob Nails, Little Washbourne, Tewkesbury, Glos. Additional information: Son of George and Emma Agg, of Alderton, Tewkesbury, Glos. Grave/Memorial Reference: II. A. 17. Additional information: Son of Samuel and Millicent Grimmett, of Alston Fields Farm, Beckford, Tewkesbury, Glos. Grave/Memorial Reference: V. E. 16. Unit Text: "D" Coy. 2nd/5th Bn. Additional information: Son of Thomas and Elizabeth Hall; husband of Matilda Holmes (formerly Hall), of Alderton, Tewkesbury, Glos. Native of Winchcombe, Glos. Grave/Memorial Reference: II. J. 1. Additional information: Son of Jane Lane, of Alston, Tewkesbury, Glos, and the late William Lane. Additional information: Son of Thomas and Emily Elizabeth Shakespeare, of Alderton, Tewkesbury, Glos. Additional information: Son of Frank John and Rose Ann Pullom, of Hollow Brook, Condeston, nr. Tewkesbury, Gloucestershire. Grave/Memorial Reference: I. B. 27. Additional information: Son of Maurice Victor and Marjorie Lewes Day, of Alderton. Additional information: Son of William Edward and Phoebe Jessie Newman, of Alderton, Gloucestershire. Grave/Memorial Reference: 1. R. 17. Additional information: Nephew of Mr. and Mrs. V. Cook, of Great Washbourne, Gloucestershire. Grave/Memorial Reference: Panel 38, Column 2. LT/JX. 187268. RN. Patrol Service. H.M. Yacht Campeador V. 22nd June, 1940. Hired for anti-submarine duties September 1939, sunk by mine off Portsmouth.